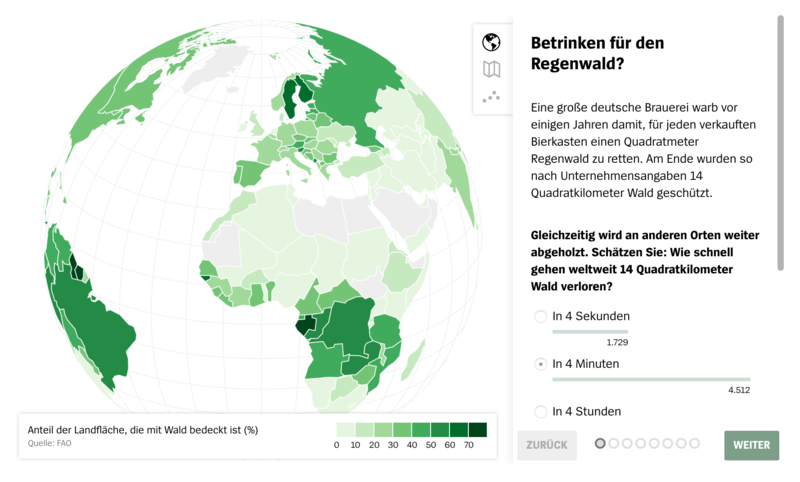 We created an interactive data-driven globe which features the opportunity to compare your behavior with global statistics. It dives deeply into the sustainable development goals‘ statistical basis, so hard-to-grasp data can be easily interpreted. The platform is highly customizable through a JSON data structure, which is used to publish one sustainable development goal every month. This project compiles both interactive features and reports, neatly arranged and meaningfully interconnected. For and with Lokaler (Lorenz Matzat) & Spiegel Online (Christina Elmer, Anna Behrend).